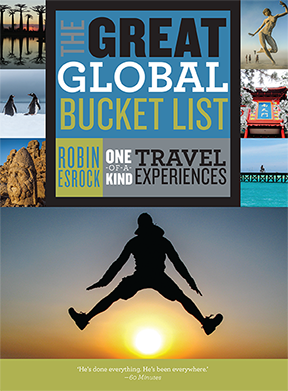 After selling out of its first print run in 2016, The Great Global Bucket list is back! For over a decade, renowned travel journalist, bestselling author and TV host Robin Esrock scoured the globe in search of one-of-a-kind, bucket list–worthy experiences. During his remarkable journey to over 100 countries on seven continents, Esrock uncovered unique adventures, fascinating histories, cultural spectacles, natural wonders, hilarious situations and unforgettable characters – proving that modern travel is so much more than just over-trafficked tourist attractions. From the Amazon jungle to the beaches of Zanzibar, The Great Global Bucket List presents the world we don’t hear much about in the news: a planet that is strikingly beautiful, thought-provoking, incredibly diverse and sometimes just very, very funny. With his trademark wit, photography and insight, Esrock introduces the inspiring experiences you’ll be talking and dreaming about for many years to come.
. . . and that ’s just the tip of the proverbial metaphor!